Friday, June 26, Rebecca and I lumbered along a route resembling the flight of a drunken crow as we drove from Winona, MS in a southeasterly direction headed for Florida. The Gospel chariot was laden down with Bonnie’s clothes (for Martha Noland in Ocala, FL), display material, literature and luggage. Picture Rebecca and me wedged in the command module of our little black space shuttle with barely enough room for ourselves. We paused en route the next two days to consume homemade tuna sandwiches that we had prepared for our lunches. Weary from the first day’s journey, we lodged in Troy, AL at the Best Western Inn. Rain greeted us throughout the day as well as when we left the hotel for supper. The trip that day was uneventful except for a couple vehicles that seemed to want to play bumper car, but we resisted. Sunday evening, we worshipped with the Riverview Church of Christ, and I gave my “Overview & Update” PowerPoint once more. Both congregations received us well, and the latter made a special financial participation with me in my mission endeavors. Following worship, Rebecca and I traveled to the home of Bob and Martha Noland in Ocala, FL. He has served for many years as an elder and a Gospel preacher, and of course, Martha has been a valuable component, too, in their service to our Lord Jesus Christ. Just before our arrival, we received a mobile call as we were driving that Bob was having a medical crisis. When we got to their home, EMS personnel were assisting them, and finally, they placed Bob in Bob and Martha’s van for a trip to a cancer hospital an hour away in Gainesville, FL. Rebecca and I rode along. Test after test was performed on Bob. However, after spending hours in the Emergency Room with no progress toward admitting Bob to the hospital, Rebecca and I returned to the Noland home in Ocala. We got to bed finally between 4:30 a.m. and 5:00 a.m.
Later in the day Monday, we gathered up the Noland’s granddaughter who had been deposited at Christian brethren and friends of the Nolands. The three of us, then, proceeded to return to the hospital in Gainesville. 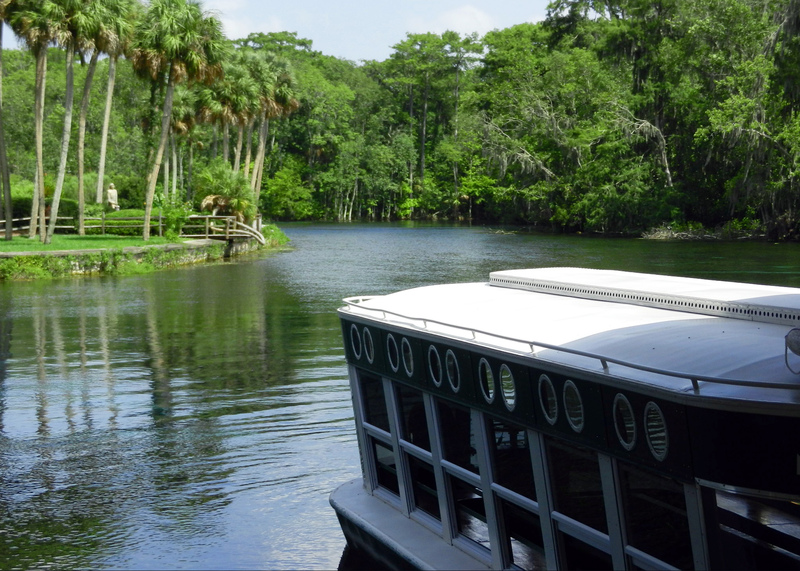 That evening, we returned to Ocala. The water was crystal clear, and the depths were deceptively deeper than they appeared. We saw the bluest freshwater fish we had ever observed, plus turtles, gar and other fish. Later while walking adjacent to the river, we spied an alligator at water’s edge. We also saw monkeys, regionally appropriate birds and lizards. So, we “played” a little – or smelled the roses somewhat. However, Rebecca and I worked as well. Finally, Tuesday evening, we completed entry of articles in a database, chronicling articles already used in The Voice of Truth International so we can distinguish them more easily from articles that have not yet been used in VOTI. We entered articles for over 300 pages encompassing three recent editions of the magazine. I also worked on Gospel Gazette Online a little plus other office work (in my mobile office – on my lap). Saturday, Rebecca and I will travel to DeFuniak Springs in preparation for speaking all day Sunday for the Liberty Church of Christ. Between now and then, we will continue to work especially on VOTI and GGO. Monday, we will begin our return trip to Winona, MS. Thank you for your interest in my efforts for the cause of Christ. I continue to make appointments both for stateside travel as well as overseas venues in five countries for this fall and into next year. Please pray for me, and let me know what dates you would like me to visit your congregation (mission report, preaching, Gospel meeting, etc.). This morning (Wednesday, June 24, 2015) after scarfing down a quick bowl of Fruit Loops cereal and downing some OJ, I started some yard work early in an attempt to beat the abusive heat of late. In the midst of that undertaking, my coworker Jerry Bates arrived with a trailer in tow to retrieve the contents of Bonnie’s sewing room. Jerry, my daughter Rebecca and I commenced loading the small trailer with two sewing machines, one serger, attachments, sewing material, threads, sewing books, notions, patterns, manikin and notions. Brother Jerry Bates volunteered to take all of that to the Action, TN Church of Christ as he and Paula are out this weekend for a preaching appointment not far from Acton. That congregation has a sewing ministry for stateside and overseas outreach and benevolence. I can’t think of a better disposition for Bonnie’s sewing enterprise in view of her passing away. Almost but not quite finished with the yard work for the day, a visitor came by the World Evangelism Building. Rebecca and I, dirty and sweaty, moseyed down to the warehouse/office to visit for a while with brother Paul Franks who had come by. He and his father and mother publish the Magnolia Messenger. About an hour later, a freightliner pulled into the World Evangelism parking lot. Aboard were six pallets containing 15,000 copies of volume 85 of The Voice of Truth International. It was printed in Hong Kong with color throughout for the same price of printing black and white inside here in the States. This edition will not be going out very soon since we just shipped volume 84. However, coming from across the globe, it is necessary to allow for transit via oceangoing ship. Fortunately, youth from three congregations have been laboring in the city with the Winona Church of Christ. While teenage boys were otherwise deployed, several teen girls came to our rescue and loaded the hundreds of boxes into the warehouse; they are from the Siwell Road Church of Christ in Jackson, MS. These young ladies came to do the heavy lifting and by making a human chain, they made short work of the undertaking, despite a blazing hot Mississippi summer day. That evening, Rebecca and I visited the Elliott, MS Church of Christ. About a year behind or 60 appointments overdue owing to Bonnie’s illness and death, I made my “Overview & Update” PowerPoint presentation. We were well received and encouraged. Tomorrow promises to be no less full, and Friday we leave for two Sundays of speaking engagements in Florida. Help me fill my calendar and let me know when your congregation prefers an appointment. 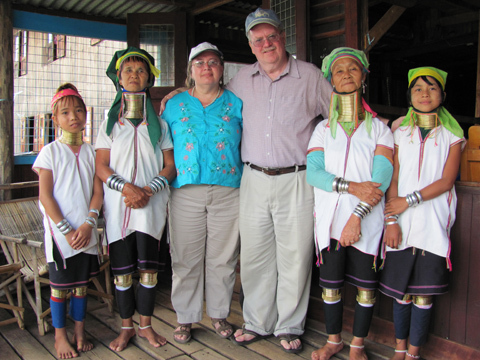 I am also trying to lineup dates for my travels to Asian countries this fall, as well as 2016, too. Asked what plans I have for the future, I reply that Lord willing, as long as I have my health and as long as I live, I plan to keep on keeping on in the service of our Lord Jesus Christ with stateside and foreign missions. Your prayers, encouragement and participation are always greatly appreciated. Sunday morning, June 21 commenced with Rebecca and me exiting Winona, MS just before 7:30 a.m. We headed out of town in a southeasterly direction, completely trusting ourselves to the guidance of the car’s GPS system. Two hours later, after having traveled what was a new route for me, we arrived at the meetinghouse of the Union, MS Church of Christ moments prior to the start of Bible class. The occasion for an invitation to speak for the Union Church of Christ (not to be confused with the Old Union Church of Christ elsewhere in Mississippi) this Sunday was the fellowship meal following worship. Christians the world over know how to enjoy one another’s company over delicious home cooked vittles. This pleasant congregation sent me on my way that afternoon with hearty financial support to help me facilitate the mission work to which I devote myself. Though the Union church does not support me monthly in my labors, the periodic funds that it sends my way equals and in some cases exceeds that of monthly supporters. I am truly thankful for every encouragement and participation in my labors for the Lord. Next, Rebecca and I drove back to my Winona home. While there briefly, we used it as a way station. I took opportunity to unload and load the dishwasher, which I hadn’t taken time to attend earlier in the day. Leaving Winona for the second time the same day, we pointed the Lord’s car toward Courtland, MS, the site of my early evening appointment. We arrived too early, but I would much rather be early than the least bit late – which sometimes has occurred when going to other destinations. There during evening worship, I made my PowerPoint presentation “Overview and Update” regarding my stateside and overseas activities in the service of our Lord. The Courtland Church of Christ, also not a monthly supporter, nevertheless, sent me on my way with substantial financial gifts – a large sum as a memorial for my late wife Bonnie, a lesser amount for speaking and a significant gift from one of the families. A significant portion of my fundraising comes from congregations that I visit and for which I speak. With Bonnie’s illness leading up to her passing, I am about 60 appointments behind, and accordingly impoverished respecting those kind of monetary gifts. Mounting our motorized steed once more, Rebecca and I continued north to her domicile in Collierville, TN – a suburb of metropolitan Memphis. I often use her home as a bed and breakfast to interrupt my travels northwardly or westward across the Mississippi River or when traveling in a northeastwardly direction. The reason for this particular stopover was to position us for Monday’s travel to Nashville, TN with hundreds of pounds of Bibles, books and tracts, which I am shipping to Guyana, South America. Monday morning we said goodbye to Rebecca’s home and began another long day of driving, driving and more driving. First, we took another package of leftover medical accessories from Bonnie’s illness to the church building of the Collierville Church of Christ with whom Rebecca ordinarily worships. Distribution will be made as in the past at other times to Christians who can benefit from such. Next, we swung by the nearby home of the congregation’s preacher and his wife, Torrey and Alexander Clark. With them in tow, we pointed my Gospel chariot toward Nashville for the purpose of delivering our precious cargo to Caribbean Shipping Service. The Collierville congregation enabled me to purchase $1,200 worth of Bibles, and I tasked brother Clark to be the representative of the church to see them shipped. We had on board 160 Gift and Award Bibles for members of the churches of Christ in Guyana who lack Bibles, plus 30 Reference Bibles for about a third of the Gospel preachers in that country who do not possess as useful of a copy of the Bible from which they can prepare and present sermons and Bible studies. Coupled with those items were 30 Hailey’s Bible Handbook, about 12 dozens copies of various issues of The Voice of Truth International, miscellaneous editions of Freed Hardeman lectureship books and 1,900 tracts. In addition, some small New Testaments and Bible bookmarks completed our shipment inventory. Later, I will return to the shipping company with nearly 2,000 copies of The Voice of Truth International for all of the churches of Christ in Guyana. Brother Nigel Milo with whom I work directly in Guyana prefers shipments in barrels. Therefore, once more I do my best to cram rectangular boxes in cylindrical barrels – reminding me of the adage of trying to put square pegs in round holes. We managed to place everything we hauled on this occasion in two brown, corrugated barrels. Barring any complications, they will arrive in Guyana sometime in August. The shipping date will be the middle of July by oceangoing freighter. It was a happy experience to spend precious time together with the Clarks. They introduced Rebecca and me to a Nashville area restaurant with which we were not familiar. In addition, on the way out of Nashville, they took us to McKay Books – a mammoth used and new book warehouse-like store. Although I wasn’t looking for anything, I did manage to buy a new book for $2, which was written by one of our Christian brethren. Rebecca, of course, being the book fanatic that she is as well as being a schoolteacher, left with several titles in her possession. Finally, we made the return trip to Collierville and our temporary, one more night abode in Rebecca’s home. Sometimes in our travels, it seems that we only pause long enough to make a mess and not long enough to clean up after ourselves. Tuesday, we will head back to Winona, MS. Work of all varieties await us in my house, at the office and on the road – driving, driving and driving some more. Later in the week I will speak for a local congregation, before traveling to Florida for preaching appointments over the next two Sundays. Please remember me in your prayers. Your encouragement and every participation with me is greatly appreciated. Saturday, June 13, my daughter Rebecca and I mowed the grass at my Winona home. The old string trimmer finally got the best of me, despite spending good money to have it overhauled. Someone took advantage of my gift set at the curb and gave it a new home. Instead, I bought a new machine that I could actually start! I think bugs, creatures and machines hate me. I’m a magnet, so it would seem, for bugs, snakes and poisonous plants – and machines refuse to work for such as me. The walk behind mower wouldn’t allow me to finish off the yard. Rebecca and I rescued a fallen, blooming flower stem, taking it into the house to enjoy. 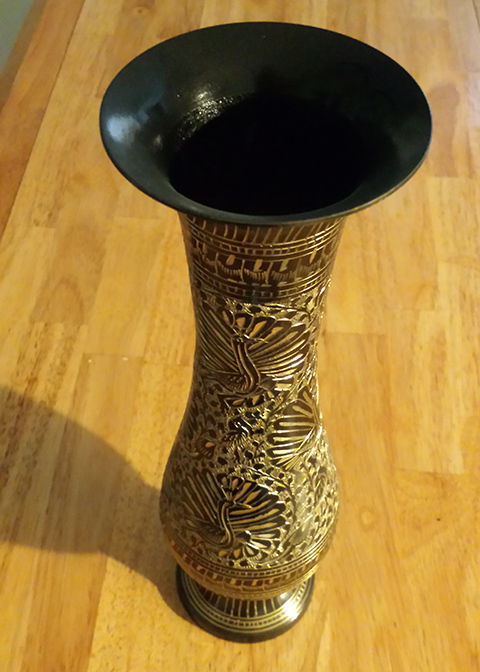 Imagine our astonishment, amusement and befuddlement when we put water into the brass vase that was given to us by foreign brethren. Multiple spouts of water sprung forth from its sides through the etchings by which elegant designs were carved in the vase. Apparently, some of the carving was just a little too deep – all the way through! Sunday, it was our pleasure to worship with the Indianola, MS Church of Christ as I filled in for its preacher who was away. We are always wonderfully received by the brethren of that small band of Christians. During Bible class, I made the PowerPoint presentation, Update & Overview of my mission work and that of my coworkers. During the worship periods, I presented a PowerPoint in the morning about The Church in Prophecy and a lesson that night entitled, Redemption, Forgiveness, Justification & Sanctification. Rebecca and I enjoyed the hospitality for the afternoon with Madolyn and Gene Gibson in their Moorehood, MS home and university student center. A young couple from the congregation likewise participated with us as guests also of the Gibsons. After evening worship, several members and we fellowshipped over fast food at Wendy’s. It was a good day. The last days of Bonnie’s life, I only fulfilled preaching appointments that were initiated by the congregations requesting my presence. Bonnie determined, though, to accompany me on each of those little outings, and she even taught a ladies’ class on one of those occasions (her last class). My day at Indianola was one of those requests from a congregation, but henceforth, I am actively scheduling appointments stateside and overseas through the summer of 2016. I’m back, having gotten behind on 60 appointments in the USA alone. Typically, I will travel up to 3,000 miles monthly by car. Monday and Tuesday, I continued to play catchup on a number of things at the house and in the office. Rebecca continues to be a blessing and a helper in this difficult time. Monday, I paid Bonnie’s funeral expenses and prepaid my funeral expenses as well. I purchased a double headstone for our grave, too. Most of Tuesday was spent revamping the digital templates for the production of The Voice of Truth International. Bonnie may be resting from her labors, but the rest of us trudge onward – until it is our time to enter eternal rest. Comments: Comments Off on Won’t Hold Water! 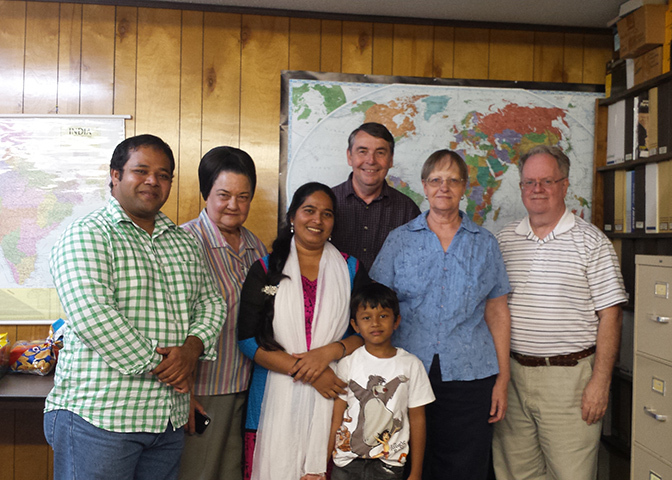 Pictured around the table from the front left are Rebecca Rushmore, Sudeepa & Justin Gootam, Jerry & Paula Bates, Ricky Gootam, Betty Choate and Barbara Oliver. Louis Rushmore is taking the picture. Monday, June 8 was a day filled with diverse activity. Anticipating rainy weather (again), Rebecca and I worked a little in the yard that morning. The string trimmer in which I devoted some money lately just wouldn’t start for me. So, gassed up, newly loaded with trimming line, having had the carburetor just rebuilt and fuel lines replaced, I set it down near the road with a “Free” sign on it. Not many hours later, it just walked away apparently into someone else’s yard. (I need to be careful that a lawnmower or some other piece of equipment doesn’t run out of fuel too close to the road for fear some passerby will mistake it for something else I am giving away to a new home. I have given a few things away on purpose that way and don’t want to give something I’m still using away accidentally!) Alas, after exhaustive research (my way of buying something that drove my wife mad), I bought a replacement string trimmer – a good one at a fair price. Rebecca helped me gather up the trim branches and bushes that respectively were hanging low or protruding into the yard that I had wacked off with a battery-powered hedge trimmer. After cleaning ourselves up, we proceeded to the World Evangelism Building. There, coworker Jerry Bates graciously agreed to pack a couple of book orders that arrived in my email box while I worked on publishing Gospel Gazette Online for June to the Internet. It took me a while to finalize it and upload it, but by yesterday afternoon, Number 17, Volume 6 of GAZ began to make its way into the homes of over 1,600 subscribers plus non-subscribers, too. 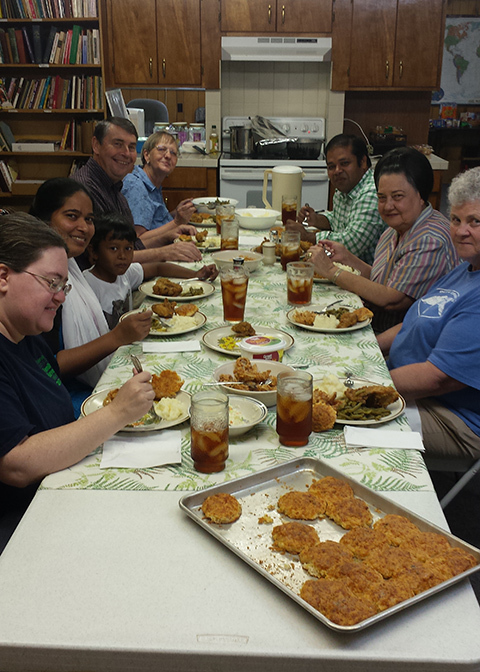 Paula Bates had prepared a meal to accommodate local World Evangelism team members as well as special guests. Brother Ricky Gootam, his wife Sudeepa and their 7-year-old child Justin were visiting us in Winona, MS from Kakinada, India. We work with the Gootams among others throughout our evangelistic efforts in India. Before we noticed, it was 7 p.m. Sister Sudeepa accepted my gift of national dress from India and Myanmar that formerly Bonnie wore when we traveled to those two countries. Sudeepa had given Bonnie one of the outfits one time while we were in Kakinada. Finally last night (working on it to nearly midnight), Rebecca and I prepared for mailing Thank You cards to some of the many Christians who attended to our needs preceding and during the funeral for my beloved wife Bonnie. There is no way to adequately express our appreciation for the good deeds, kindnesses and prayers performed on our behalf at this fragile and difficult time for my family and me. On a slightly brighter note, over $6,000 so far has been contributed so far by individual Christians and congregations of the Lord’s church for a memorial fund for Bonnie. All proceeds will be used to provide Bibles and Christian literature in the foreign nations to which Bonnie and I took the Gospel of Christ these past years. Bonnie and I have been overwhelmed by various overtures of brethren toward us during her struggle these past three years with pancreatic cancer. I am no less stunned by the turnout for her funeral, the hundreds of letters, cards, phone calls, emails, texts, Facebook posts, etc., as well as the outpouring of monetary gifts as a tribute and memorial to her labors for the Lord – which continue to live on after her. Some of the responses we receive from around the world are from souls we have never met, but who have reveled in our writings that have preceded us and gone farther than we could go. My emotions are on a rollercoaster, and I am exceedingly lonely without Bonnie despite being surrounded by family and Christian friends. Nevertheless, I bolster my weak moments with a resolve to redeem the time while I may, working as diligently for the Lord as I can while for me time remains. I further resolve to conduct myself daily in such a way to be holy and honor my wife, so that one day I, too, might rest from my labors with the spirit of my Bonnie and heaven’s park bench inside those pearly gates of heaven. Brethren, please continue to pray for me. A lot has happened since my dear wife passed away Monday, May 18, 2015. Between the overwhelming moments of sorrow that punctuate my days, work for the Lord is ongoing. I participate in the shipping and receiving of Christian literature from our base in Winona, MS. Numerous details regarding accounts of the deceased must be attended to. Workload must be shifted, and a great catchup effort continues. The Rushmore Newsletter has been worked up and is at the printing company now, but the electronic version is online now (per the following paragraphs). The June issue of Gospel Gazette Online is nearly complete and will be published tomorrow. Monday, I will jump in with both feet, so to speak, on preparation of volume 86 of The Voice of Truth International. Volume 84 is or will be going out in the mail any day now; volume 85 will arrive via freightliner in a few days from Hong Kong. Plans are underway already for my fall mission trip to Myanmar and India with maybe programs in Sri Lanka and Singapore, too. In addition, preliminary plans are being formed for an extensive mission program in Guyana, South America in 2016. Next Sunday, I resume stateside travel to churches of Christ weekly to acquaint them with my mission work or to present biblical lessons. Select “Rushmore Newsletter” in the masthead of Gospel Gazette Online at Website: www.gospelgazette.com and select the 2015 June hyperlink. Go directly to the latest Rushmore Newsletter by clicking on http://www.gospelgazette.com/Newsletter/2015/06_2015_newsletter.pdf, allowing sufficient time for the file to load.